Department of Oncology, Transplants and Advanced Technologies in Medicine, Division of Paleopathology, History of Medicine and Bioethics, University of Pisa; 1Department of Archaeology and History of Art, Section of Medieval Archaeology, University of Siena; 2Department of Oncology, Transplants and Advanced Technologies in Medicine, Division of Diagnostic and Interventional Radiology, University of Pisa; 3Department of Clinical Physiopathology, Section of Clinical Radiology, University of Florence, Italy. A paleopathological study was carried out on the she skeletal remains of Cardinal Carlo de’ Medici (1595-1666), son of the Grand Duke Ferdinando I (1549-1609) and Cristina from Lorraine (1565-1636), to investigate the articular pathology described in the archival sources. The skeletal remains of Carlo, buried in the Basilica of San Lorenzo in Florence, have been exhumed and submitted to macroscopic and radiological examination. The skeleton of Carlo revealed a concentration of different severe pathologies. Ankylosis of the cervical column, associated with other facial and spine anomalies suggests a diagnosis of congenital disease: the Klippel-Feil syndrome. In addition, the cervical segment presents the results of the tuberculosis (Pott’s disease) from which the Cardinal suffered in his infancy. The post-cranial skeleton shows an ankylosing disease, mainly symmetrical and extremely severe, involving the large as well as small articulations, and characterized by massive joint fusion, that totally disabled the Cardinal in his last years of life. The final diagnosis suggests an advanced, ankylosing stage of rheumatoid arthritis. Rheumatoid arthritis, ankylosis, tuberculosis, Medici, Florence, Renaissance. The well-preserved skeleton of Cardinal Carlo de’ Medici (1595-1666), the younger son of Grand Duke Ferdinando I (1549-1609) and Cristina of Lorraine (1565-1636), has been exhumed and subjected to careful examination. The cardinal was buried beneath the floor of the Basilica of San Lorenzo in Florence, together with the other members of the junior branch of the family of the grand dukes of Tuscany, which began with Giovanni delle Bande Nere (1498-1526), a famous captain of mercenary troops, and ended with Gian Gastone (1671-1737), the last Medici grand duke. The Medici were one of the most powerful and influential families of the Italian Renaissance. On the foundations of a successful commercial and banking business, they accumulated long-lasting social power and political prominence, initially in Florence and later in the entire region of Tuscany. With the generous permission of Dr. Antonio Paolucci, Superintendent of the Museums of Florence, in 2004 the “Medici Project” was officially launched. This is a multidisciplinary research project devoted to the study of the 49 members of the Medici family buried in the Basilica of San Lorenzo, involving research groups from the University of Pisa, the University of Florence and the Superintendency for the Museums of Florence. 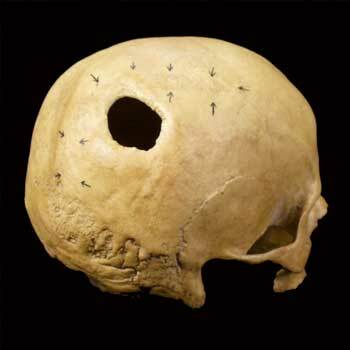 So far the skeletal remains in twenty tombs, including those of nine children, have been studied (1, 2). Carlo (Fig. 1) was the third son of Ferdinando I and Cristina of Lorraine and was early in his life directed toward an ecclesiastic career, which lasted more than fifty years, during which he was appointed to various prestigious positions. In 1615, at the age of 20, he became a cardinal under Pope Paolo V and in 1652 he was nominated Dean of the Sacred College of Cardinals. Carlo loved the pleasures of life, however; his favourite pastimes were hunting, feasting, gambling, and gallant conversation. He was passionately fond of music and the theatre, he commissioned and collected works of art, and he had several of the Medici residences restored and redecorated. Archival documents attest to the fact that Carlo suffered from many diseases during his life. At the age of 8 he was infected with tuberculosis, resulting in the deformation of his cervical column (Pott’s disease). In addition, documents inform us that he suffered from an acute joint disorder involving the feet, hands and knees, which began at the age of 24 and was identified by the court physicians as ‘gout’; Carlo suffered 18 severe attacks between the age of 35 and 59, and his condition markedly worsened between the age of 60 and 65. Indeed, it appears that the cardinal was totally disabled during the last years of his life; from 1658, when he was 63, he was no longer able to sign letters or documents. In a letter to a nephew dated 4th December 1658 he writes: “Y(our) H(ighness) please excuse me for not being able to sign in my own hand (writing), because my hand does not function” (3). 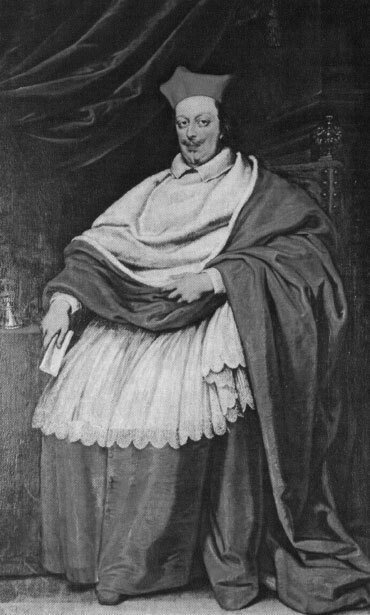 From the age of 50 to 70 the cardinal was affected by recurrent bronchitis and he finally died of bronchopneumonia at 71 years of age (3). The present study discusses the joint lesions observed in the skeleton of this important member of the Medici family. Fig. 1. A portrait of Cardinal Carlo de’ Medici by Justus Sustermans (Galleria Palatina). Fig. 2. 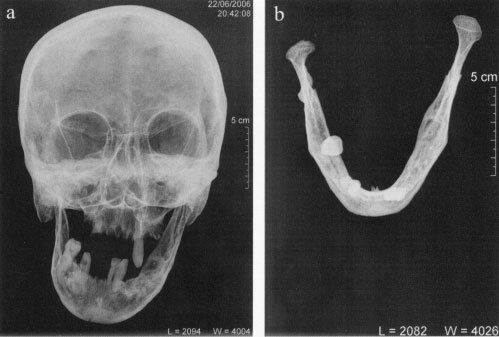 Antero-posterior projection of the skull showing evident asymmetry of the facial skeleton at the level of the nasal and maxillary bones, which appear larger on the left side: (a); marked hypoplasia of the right hemi-mandible corpus of the mandible, visible on x-ray (b). The remains of Carlo de’ Medici were buried, together with those of his parents Ferdinando I and Cristina of Lorraine and his brother Francesco, in a side chapel of the Basilica of San Lorenzo. His skeleton, as well as those of other family members in San Lorenzo, had already been studied during the Second World War (4), so the remains of Carlo were not located in their original burial place. The remains are well preserved, with the exception of some missing middle and terminal phalanges of the hands and feet. The bones were first examined macroscopically and then by x-ray at the Careggi Hospital in Florence. The pathological segments were also scanned by CT.
Anthropological study showed the skeleton of a elderly male (more than 60 years of age) with several anomalies and pathologies. The facial skeleton presents asymmetry of the nasal and maxillary bones, which appear larger on the left side (Fig. 2a). There is marked hypoplasia of the right hemi-mandible corpus and the right ramus (Fig. 2b). The atlas is totally fused with the occipital bone. The cervical column is fused in a single block from the first to the fifth vertebrae, involving the articular facets, pillars and posterior portions of the vertebral bodies, with narrow disc spaces. The axis is fixed in an abnormal oblique right-directed position (Figs. 3 and 4). This anomaly probably resulted in a chronic torticollis in vita. A second block at the level of C6-C7 and involving the entire vertebral bodies also shows a wedge-shaped collapse, with the formation of an angular kyphosis (Fig. 3b, black arrow). CT demonstrated some osteolytic lesions with no sclerotic margins (Fig. 4b, white arrow). Several other column fusions involving the articular facets, pillars and posterior vertebral bodies are present: T2 is merged with T3, T7 with T8, T9 with T10, and T11 with T12. Ossification of the anterior right vertebral ligament at the level of the T9 and T10 vertebral bodies led to the formation of a bony bridge. The remaining vertebrae are normal. With regard to the lumbar spine, L5 is fused with a supernumerary L6. Finally, the right innominate bone of the pelvis is fused with the sacrum, while the left sacro-iliac joint is normal (Fig. 5, black arrow). In the thoracic area, the manubrium of the sternum presents marked ossification of the sterno-costal cartilage on both sides, which is more severe on the left. The internal surfaces of most of the ribs show a slight diffuse periostitis. The right humerus and ulna are totally fused, with the elbow fixed in a flexion of 110°. In addition, the head of the radius is partially fused with the radial notch of the ulna. The right wrist shows total ankylosis of the distal epiphysis of the radius with the carpal bones, which are also fused together, with the exception of the hamate and the pisiform. In the right hand, the second metacarpal is merged with the trapezoid bone and the third metacarpal with the capitate bone (Fig. 6a). Ankylosis is also present between the third proximal and middle phalanxes, which are fixed in an antero-posterior curvature (Fig. 6b and c). In the left arm the elbow joint is normal, but there is fusion of the distal epiphysis of the radius with the ulna, fixing the radial head in the ulna notch, with a small amount of wrist dislocation. The distal radius is merged with the carpal bones (Fig. 6a); moreover, all the carpal bones, with the exception of the pisiform, are fused together (Fig. 6d). In the left hand, ankylosis is present between the fourth proximal and middle phalanxes, which are fixed in an antero-posterior curvature. In the lower extremities, the knees present fractures that clearly were incurred after death, at the level of the right proximal epiphysis of the tibia and the left distal epiphysis of the femur. Both femurs are totally fused with the tibiae, so that the knee joints are fixed in a posterior flexion of 90° (Fig. 7a); the patellae are also ankylosed in their respective joints (Fig. 7b and c). Both feet show total ankylosis between the talus, the calcaneus, and the tarsal and metatarsal bones (Fig. 8a and b). Several attachments for the muscles and ligaments show marked enthesopathies. All the skeletal segments, and in particular the lower limbs, are affected by severe osteoporosis.